Spread your wings and fly to the largest rooftop space in WA. It's easy to see why people flock to this versatile venue, perched above William Street. The three-storey space has a little something for everyone. Boasting three separate areas — the Perch, the Lounge Bar and the Nest Rooftop Bar — you can fly by The Aviary for any occasion and good times will ensue. The Perch, located on the ground level, is the place for post-work hangs. With a killer happy hour from 5–6pm Thursdays and Fridays — think $8 espresso martinis, $5 schooners and $6 house wine — you can debrief and say goodbye to the work week while looking out over bustling Murray Street. One level up, you'll find the Lounge Bar. It's a little more subdued — great if you want to sink into a comfy lounge, cocktail in hand, and embark on a D&M. The space can also be reserved for private events, and the feature bar is sure to impress anyone from long-time colleagues to judgy in-laws. Next, the Nest Rooftop. A pioneer of rooftop bars in Perth, it was one of the first places you could get a drink among the skyscrapers. 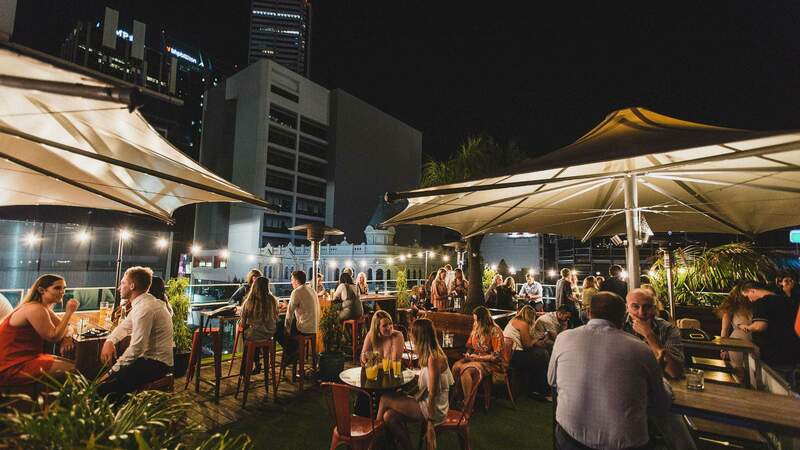 Seven years young and the largest rooftop space in WA, the Nest is still one of Perth's best bars. It feels like a summer pool party, with daybeds, fake-it-til-you-make-it AstroTurf, sun umbrellas and a resident DJ. It's no wonder so many bars followed suit.